Molecular docking, as one of the widely used virtual screening methods, aims to predict the binding-conformations of small molecule ligands to the appropriate target binding site. 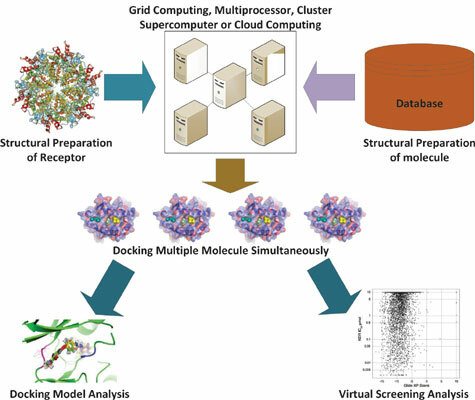 Because of the computational complexity and the arrival of the big data era, molecular docking requests High- Performance Computing (HPC) to improve its performance and accuracy. We discuss, in detail, the advances in accelerating molecular docking software in parallel, based on the different common HPC platforms, respectively. Not only the existing suitable programs have been optimized and ported to HPC platforms, but also many novel parallel algorithms have been designed and implemented. This review focuses on the techniques and methods adopted in parallelizing docking software. Where appropriate, we refer readers to exemplary case studies. Keywords: Molecular docking, Virtual screening, High-performance computing, CADD, SARS, DDGrid. Keywords:Molecular docking, Virtual screening, High-performance computing, CADD, SARS, DDGrid. Abstract:Molecular docking, as one of the widely used virtual screening methods, aims to predict the binding-conformations of small molecule ligands to the appropriate target binding site. Because of the computational complexity and the arrival of the big data era, molecular docking requests High- Performance Computing (HPC) to improve its performance and accuracy. We discuss, in detail, the advances in accelerating molecular docking software in parallel, based on the different common HPC platforms, respectively. Not only the existing suitable programs have been optimized and ported to HPC platforms, but also many novel parallel algorithms have been designed and implemented. This review focuses on the techniques and methods adopted in parallelizing docking software. Where appropriate, we refer readers to exemplary case studies.